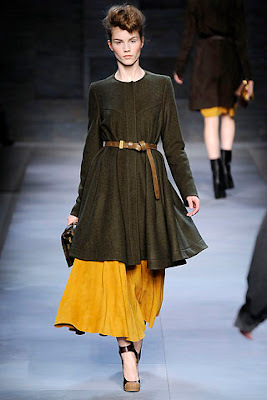 Fendi Fall 2010 RTW crafted a distinct character of feminine modesty that is empowering rather than dated. Navy, mustard, black, and forest green represent the majority of the palette that Lagerfeld drew from. Cinched waists provide a classic shape to a collection dominated with heavy looking longer skirts. It's whimsical to me because I can see the woman that would wear every single one of these outfits going to work in a WWII factory and returning home on an autumnal evening to change and take the kids to the park. Or a woman sitting well adjusted in a european apartment with molded white ceilings and grey furniture. It's classy. 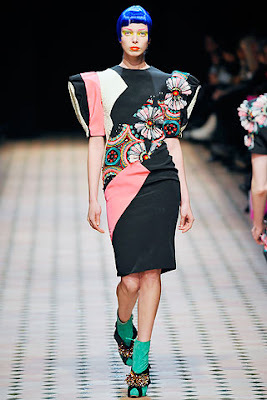 Manish Arora, Fall 2010 RTW completely veers away from what I am usually attracted to. But that can get boring anyways. This collection is covered in beads and sparkles and the shoes in the last picture are what a Matryoshka doll would be if it were a pair of stumpy heels. 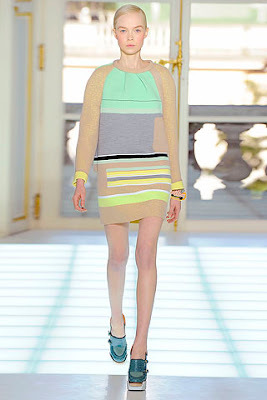 Electric colored cartoon hair on all the models is so fun. And tell me the first outfit doesn't look exactly like those sour candy strips you can buy in bulk or steal a sample of in a candy store. Who wouldn't want to be encased in a full body version of kiddie candy? Balenciaga, Fall 2010 RTW instantly made me think of a future NASA headquarters filled with desks and offices that levitate and within them, these girls manning the headsets and coordinating space flights. 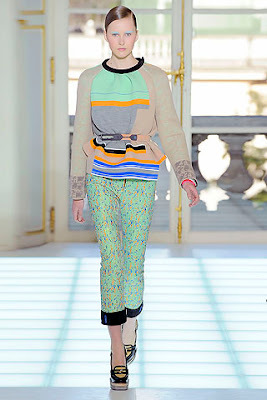 It's an obvious nod to futurism with the geometric lines pastel brows. Thankfully, it's not the same obsession with a distant fashion era that will never actually be that is all silver and shiny. The shoes look like sensible ankle protection devices. 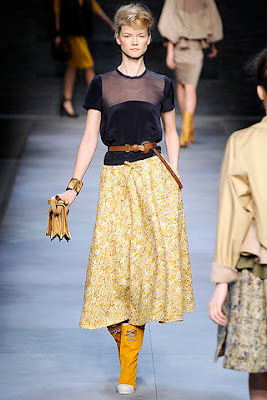 I agree, Fendi was very classy in a vintage way. Love your blog darling, and the poetry below. i love how in the third set of pictures, the colors are so sweet yet the cuts are so interesting and a-typical. really unique. love the blog! Very inspiring! 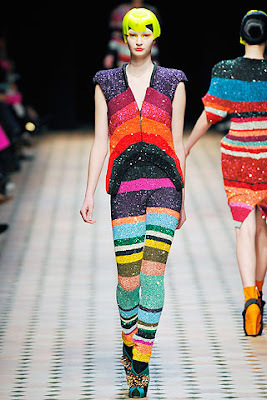 I'm kicking myself because a few days ago I found a sweater that looked EXACTLY like the Manish Arora collection at Goodwill but I put it back on the rack. 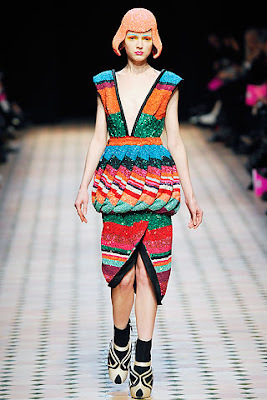 that's exactly why i loved balenciaga this season. and juliette, go back now. get in your car and GO. 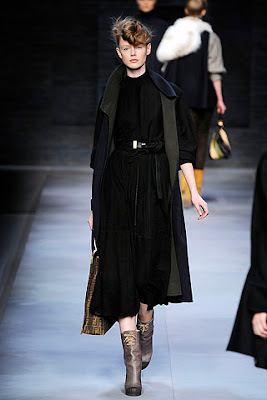 Love the fendi and balenciaga collections! Balenciaga was GENIUS. Love Love Love, (and now I'll forever be picturing those ladies sitting in the future NASA offices!) Great post..